This is essentially the story of David and Helen Philp's daughter Margaret beacause she was the one Philp who remained in New Zealand. At this point the story is taken up by Brian Johnston, a member of the only branch of the Bowie/Philp family to return to Scotland. Brian also tells the family's story with particular reference to Margaret's husband Harry Carse, a noted NZ Botanist. Margaret Philp's branch of the family has given rise to a very large number of relatives currently in new Zealand. Some of whom I am. or have been, in contact. 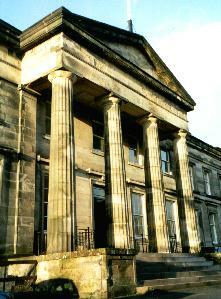 Stirling's Forgotten Builder, Alexander Bowie was my great, great, great, great grandfather. I live in the Fife coastal village of Dysart, Scotland, one of the few Bowie descendants actually living in the country of his birth. Indeed, I could have been a New Zealander (like many of my relatives in the Bowie line) had my grandfather, Harry Carse Jnr, not come to Europe as a soldier during the Great War. Injured in battle, he was taken to an Edinburgh nursing home to recuperate. It was there Harry met my grandmother, Agnes Tocher. She returned with him to New Zealand where they were married. The young couple settled in the town of Palmerston on the north island. My Aunt Margaret was born during their time there, but Agnes's homesickness eventually resulted in the family's return to Scotland. Harry, Agnes and young Margaret settled in the Kinross-shire village of Carnbo where my grandfather earned a living from his small market-garden. My mother, Mary was to be the couple's only other child. She was born in a little cottage near Carnbo on 15th February 1928. Soon afterwards the family moved to a larger house Lyncott in the same area. Here the girls were to grow up happily in a beautiful rural part of Scotland - ironically only a few miles from Stirling the town their great great great grandfather, Alexander Bowie, had helped shape architecturally a century before. I have but vague memories of my grandfather, Harry Carse. 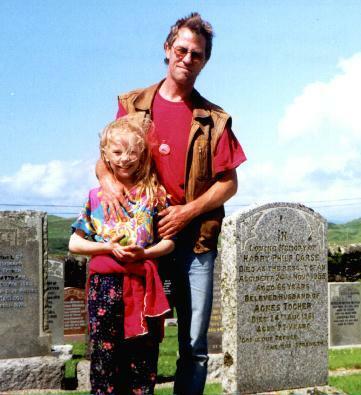 He died in a cycling accident on the Isle of Luing, on the Scottish west coast, when I was only three years old. Yet I appear to have inherited his passion for the outdoor life and an appreciation of the natural world with all its wonders - a passion which I was to learn years later, on a visit to New Zealand, had been handed down by his own father, Harry Carse Snr. Indeed, it is the story of my great grandfather which I plan to recount on these pages. For it was his adventurous journey half way around the globe in the year 1885 which resulted in his meeting with Margaret Bowie Philp, grand daughter of Alexander Bowie. They were married in Auckland on August 11th 1887 and so began the expansive Carse branch of the Bowie family tree. Harry and Margaret were to have five of a family - three girls and two boys - born between 1888 and 1900. As I grew up in Scotland I was aware of this extended family on the other side of the globe. However, it was only when I spent several months in New Zealand in the mid 1980's that I became fully aware of the intriguing nature of my great grandfather's life story. His love of the natural world and passion, in particular, for New Zealand's unique and abundant indigenous plant life led him to become one of the country's leading field botanists. When he died in 1930, Harry's extensive herbarium was left to the Canterbury Museum and later transferred to the Botany Division of the Department of Science and Industrial Research. During my stay in New Zealand I had the pleasure of visiting the DSIR premises at Lincoln, near Christchurch in the South Island where staff of the Botany Division made my wife and I very welcome. We were shown original copies of my great grandfather's many published works in the field of botanical science and were introduced to the herbarium with its file upon file of catalogued plant life. I can clearly recall being handed a file containing a perfect dried sample of indigenous flora which had been picked and pressed by my great grandfather's hand the best part of a century before. His original handwriting on the file was also perfectly preserved. The delicate specimen had been named Carex Carsei. I remember taking a photograph and in that moment experiencing a flush of pride in my great grandfather's achievement - a pride fuelled too by the absolute respect his work was being accorded by the present day scientists in this Government Department. Dr Andrew Thomson - who has since moved to the post of Director at the Centre for Studies on New Zealand Science History - enthused about the "important work� Carse had carried out in field botany during the so-called "Golden Era" around the turn of the century. "We place great store on the work produced by your great grandfather during that period," he told me. Ironically, Dr Thomson had been engaged in research on Harry Carse at the time of my surprise visit in March 1986. He was working on a Carse entry for the Dictionary of National Biographies due to be published in four volumes in 1990. 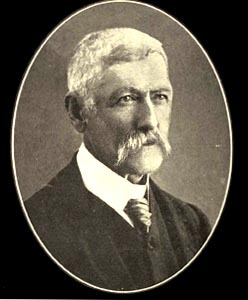 "Harry Carse (1857-1930) was a notable early New Zealand botanist of the "Golden Era", 1900-1930. On 7th March we had a visit from Carse's great grandson, Brian Johnston and his wife from Fife, Scotland. The couple had visited Carse country in Northland where they met relations including Jeanette McIntyre, Carse's great granddaughter. Brian and his wife are holidaying in New Zealand and came to us via Canterbury Museum where they were directed to Botany Division as the repository of the Carse Herbarium. I was able to refer them to Carse's published work and to see his handwriting on presentation copies of his reprints in the library. In addition, Bryony (McMillan, the herbarium keeper) explained the Carse Herbarium and Brian photographed a Carse type specimen Carex carsei." My fascination with my great grandfather's life story began not long after our arrival in New Zealand. We had an address for one of my mother's cousins in Auckland but soon discovered she was off on holiday. Rather than hang around the city for a couple of weeks, we took off for the Northland and hitch-hiked to the northern most point of New Zealand (Cape Reigna) before setting off on a coastal walk south towards Ninety Mile Beach. This was wonderful undulating coastline, from high cliffs to rolling sand dunes to vast stretches of silvery beach, always with the roar of a powerful surf sending white capped rollers in from the vast ocean to our right. Here was a wild wilderness with not another soul in sight, a place where the power of nature would inevitably leave its mark on humble passers by. We stopped for the night and pitched our tent in a sheltered glade among the dunes off Twilight Beach. Simultaneously the sun went down and a big moon rose out of the ocean. We were alone with the moon and the crashing surf, this glorious beach and our little camp fire. I'll never forget Twilight Beach, practically our first stop in New Zealand, such a beautiful place and it was almost as if we had been drawn directly there despite having no knowledge of the area. Some weeks later when we met up with my mother's cousins and fellow great grandchildren of Harry Carse, I discovered that Twilight Beach had been a favourite haunt of his. He enjoyed many botanical field trips to the area and would take friends and family members camping there. I had arrived in New Zealand for the first time and within days I found myself camped on that very beach - one of dozens in Northland and hundreds throughout the country! Amazing coincidence or had some ancestral instinct taken me there? Whatever, I now knew from whom I had inherited my wanderlust, my appreciation of wild and wonderful places and my love of the natural world. I was, from that moment, hooked on finding out all there was to know about Harry Carse. Harry's father was bank manager, William Carse. His mother, Rebecca was the daughter of Edinburgh bookseller, John MacIntosh (1793-1869). They were married in the Parish of St. Cuthbert�s, Edinburgh on the 5th May 1850. Harry was born in the town of Leek, Staffordshire, England in 1857. I have discovered little about his childhood other than much of his education took place in the town of Mussleburgh, just outside Edinburgh on the Firth of Forth. Upon leaving school Harry was to follow his father into a career in banking. He would return to England to the town of Macclesfield in Cheshire, some 30 kms north-west of his birthplace. There he worked for some years in a local bank where his father was manager. "Yes I do remember the day we went to Shutlingslow and saw the waterfall. It was on Sept 17, 1879. I keep a diary in a very regular manner and I find much pleasure in the remembrance it calls up. The walks I connect most with you are the Whaley Bridge and the Hollin Lane ones, the Whaley Bridge walk perhaps because it was the first time I had gone there on foot and the Hollin Lane one because it was the last walk I had with you. "Do you remember the circumstance? It was Saturday afternoon and the cash didn't balance. The staff went to dinner and, on returning, found Mr Dixon had discovered the mistake. So either you or Foden proposed that the three should go a walk. And a walk we went to the border of Wincle.! "When will our first reunion walk be? These jottings I trust will do you good to the extent of satisfying you that I don't forget you. I can echo with earnestness Wordsworth's lines -'Nature never did betray the heart that loved her' . And I can add that, to me, natures pleasures, though softened, are not lessened by the recollections of those with whom in bygone days I have enjoyed her charms"
These extracts are from a letter written in Macclesfield on 9th March 1885 to Harry c/o The Commander, New Zealand Steamship Vessel 'Kaikoura', Gravesend. Mr. Hamilton was responding to a letter from Harry informing him of his imminent plans to leave Britain and seek a new life in the Antipodes. The two hadn't met in four years. It would appear Harry had left Macclesfield in 1881 and had been working in a bank in Southampton prior to his decision to set off on the adventure of a lifetime at the age of 27. "Of course you have heard of my Italian wanderings. The old portion of Rome is very interesting but even it does not come up to Pompei - we used to call it Pompei at school. Alas, there is a railway station there now and the dark-eyed porter shouts out lustily 'Pomm...pee-ee'. Just think, a railway station and Caesar's commentaries with Mount Vesuvius quietly enjoying its pipe! "Naples is a fine city - a combination of all sorts of things, sea, Vesuvius and city. Italy is very much changed for the better with a government just like our own, trade has increased wonderfully. I met in with a great deal of kindness among the olive farmers. I never before understood the meaning of the 'Mount of Olives' till I went wandering through the olive hills of Italy. The trees are much larger than I expected to find them, but the prevailing look of the hill scenery is sombre, even to the colour of the olive leaf. It matches well, however, with the many old ruins which you meet on the way." William Carse, by then living in Totnes, Devon, goes on to describe to his son a local walk he had recently enjoyed in the company of his wife, Rebecca and daughter, Maimie (Harry's only sister): "Mamma, Maimie and I were at Danlish the other day and I took a wander up to Warren and Star-crop. I daresay you will well remember our croping the river from the Warren and walking to Gaclin. It seems a long lime ago now. "It is very pretty all around this neighbourhood - and now and then I go fishing and sometimes mother and Maimie come up the river in the afternoon and we have tea together. There is some really beautifull scenery on the Dart, rocks and boulders, and these always make up the most picturesque river scenery." He completes the letter: "I often joke with Mamma about putting on my knapsack and taking a wander to New Zealand. Don't be alarmed if you see me trudging up to your school someday"
William was never to join his son in New Zealand. It would have been a daunting proposition for an elderly man to take a steamship to the other side of the world, a journey of six weeks or more - in either direction. Nor would Harry ever return to the UK. But clearly it was here in the British Isles that his appreciation of the Natural World was nurtured. The seed for his extensive botanical research in New Zealand had been sown in his youth in Scotland and England and his father would appear to have been a major influence in that respect. When Harry Carse walked up the gang-plank onto the deck of the SS Kaikoura at Southampton docks that frosty morning in March 1885, he probably knew he would never walk on British soil again. However, it is very unlikely that he had anything but the vaguest clue how his life would pan out in his adopted homeland. Despite having established a career in banking in England, Harry had no job waiting for him when he landed in Auckland and by all accounts made no particular effort to re-enter the banking world. It would seem he intended to leave that life completely behind him. For a time he took whatever work came his way in the Auckland District.. That was until one R J O'Sullivan, Inspector of Schools for the Auckland Education Board, took Harry under his wing seeing in him a potential for more challenging employment than unskilled labour. Mr O'Sullivan arranged for him to take up the post of Assistant Teacher at the Newton West School. Thus my great grandfather embarked on a new career in education. From Newton West he moved on to Helensville taking up the position of 'relieving teacher' before being sent to Chelsea where he was to establish a new school in the District. He then taught for a spell at the Hunua School before accepting a post in Northland. It was this move to the Kaitaia School in April 1893 that was to spark a remarkable parallel career in Taxonomic Botany. Here Harry met Richard Henry Matthews who was a foundation member of the school committee and the two soon became close friends despite Matthews being the elder by 22 years. Their common bond was an enduring interest in native plant-life and despite the fact that neither had an expert knowledge in the biological field, both enjoyed endless field trips during which they collected and catalogued many indigenous species. The work they were doing as a hobby was soon to be noted by the New Zealand botanical establishment. In the summer of 1896 Matthews wrote to botanist, T F Cheeseman asking for some help in identification, mentioning that he and Harry Carse had collected over 80 varieties of ferns within a radius of about four miles. This letter would mark the beginning of a 30-year relationship between Harry and his adopted land's professional botanists. "Harry Carse's achievements in the domain of New Zealand field botany will be more greatly appreciated when it is remembered that he was largely self taught, having acquired his fund of botanical knowledge by wide reading and unceasing study and observation in the field." After taking up another teaching post at Maungatapere School early in 1898, Harry began corresponding regularly with Cheeseman as well as Donald Petrie who was the Chief Inspector of Schools for the Auckland Education Board. Petrie was also a devoted Taxonomic Botanist and by all accounts gave Harry much assistance and encouragement during these early years. Around this time also Cheeseman suggested to Harry in a letter that he collect materials for a plant list of Whangarei County, a task which he happily carried out and the results of which were to manifest themselves in Cheeseman's "Illustrations of New Zealand Flora" (1914) where one section entitled Schoenus Carsei was based on Harry's specimens from Maungatapere, collected on January 25th, 1899. My great grandfather had now established himself in the teaching profession but clearly his first love was the land, his botanical research and the outdoor life. Teaching paid the bills, kept his family fed and clothed and, by coincidence (? ), provided lengthy summer breaks during which he and old pal Richard Matthews would take off into the wilds of the Northland in search of new specimens. Clearly, after almost 15 years at the blackboard, Harry was hankering after an alternative to teaching and on January 14th 1902 he wrote to Cheeseman: "I have been up to Kaitaia to look at some land as I have finally decided to give up teaching and try dairy farming. I am about to purchase a farm at Fairburn." In March that year he retired from teaching and took up dairy farming at Fairburn, a tiny community some 12 miles to the east of Kaitaia. At the same time he and Matthews embarked on an extensive field project compiling a list of all the indigenous and naturalised higher plants in Mangonui County. He wrote to Cheeseman on April 6th 1902: "Mr Matthews and I have already added 93 plants to your list." Later, in a published work, Cheeseman would acknowledge Harry's contribution to New Zealand botany over some 13 years with the following: "Mr H Carse, now resident in Mangonui County, has botanized in several portions of the Auckland Provincial District. He has given special attention to the Cyperaceae, adding Schoenus carsei and Lepidosperma filiforme to the list of those already known to occur in the colony. He was also the first to observe the curious little plant which I have provisionally described under the name of Tirthuria inconspicua." This project eventually became Harry's most important work resulting in his publication, in 1911, of a paper entitled "On the Flora of the Mangonui County". After an historical introduction he describes the vegetation of the forests, moorlands, swamps, lakes and rivers, sea-cliffs and beaches and sand dunes. The lakes are described in detail and Harry's special interest in plants of wetlands is nowhere more evident. There are sections on orchids, ferns and their allies, and plants suitable for cultivation. Then follws a catalogue of 538 species of indigenous flowering plants, ferns and lycopods found in the southern portion of Mangonui County, followed by a list of 180 species of naturalised plants. During the summer of 1916 Harry and Blen travelled south and climbed Mount Te Aroha on the beautiful Coromandel Peninsula. Two years later the pair were to be found collecting specimens on the Volcanic Plateau at Tongariro and Ruapehu at the centre of New Zealand's north island. At the age of 62 Harry was clearly as fit and active as ever in his pursuit of the country�s botanical data.